Discovered by Kamoya Kimeu in 1984 at Nariokotome near Lake Turkana in Kenya (Brown et al.1985; Leakey and Lewin, 1992; Walker and Leakey, 1993). 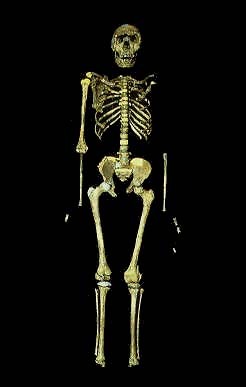 This is an almost complete skeleton of an 11 or 12 year old boy, the only major omissions being the hands and feet. (Some scientists believe erectus matured faster than modern humans, and that he was really about 9 years old (Leakey and Lewin 1992).) 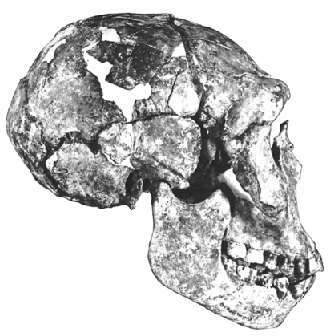 It is the most complete known specimen of H. erectus, and also one of the oldest, at 1.6 million years. The brain size was 880 cc, and it is estimated that it would have been 910 cc at adulthood (a modern human of comparable size would be expected to have a brain size of about 1350 cc). The boy was 160 cm (5'3") tall, and estimates are that he might have been about 185 cm (6'1") as an adult. Except for the skull, the skeleton is very similar to that of modern boys, although there are a number of small differences. The most striking is that the holes in his vertebrae, through which the spinal cord goes, have only about half the cross-sectional area found in modern humans. One suggested explanation for this is that the boy lacked the fine motor control we have in the thorax to control speech, implying that he wasn't nearly as fluent a speaker as modern humans are (Walker and Shipman 1996). "I think [the Turkana Boy] is remarkable because it's so complete, but perhaps another aspect that is often overlooked is that many people who don't like the idea of human evolution have been able to discount much of the work that we've done on the basis that it's built on fragmentary evidence. There have just been bits and pieces, and who knows, those little bits of bone could belong to anything. To confront some of these people with a complete skeleton that is human and is so obviously related to us in a context where it's definitely one and a half million years or even more is fairly convincing evidence, and I think many of the people who are fence-sitters on this discussion about creationism vs. evolution are going to have to get off the fence in the light of this discovery."